Emerging through Eastern Tradition, the term Puja is believed to be derived from the Dravidian word ‘pu-chey’, meaning flower action or worship with the offering of flowers. Some trace it to the Tamil word ‘pusu’, meaning to anoint or smear with sandalwood paste or vermilion. The term puja is now used to include many forms of ceremonial expressions of reverence, love, & gratitude as well as the invocation of Divine Intervention and blessing through engaging with the Divine Beings associated with the Puja Event. It could be said that a Puja is something akin to a ceremony which contains the elements of prayer, invocation, gratitude, Light activation, Love & Divine Grace and Blessing. A Puja is a Focus to engage the Forces of Light and Divine Being to assist folks in moving into greater Light, greater Love, greater Joy, greater Peace, Harmony and Balance. The Puja Ceremony creates a powerful Focus of Light and Energy which essentially triggers major support and clearances, as well as Light Codes and Activations for each one in accord to the will of their own I AM Presence. How specifically can this help me? Most folks have a number of conscious and unconscious mental-emotional-energetic constructs in the form of thought-forms, notions, ideas, beliefs and various behavior-response-energy patterns which were born out of old programming and woundedness from the past. These constructs and patterns can sometimes hold us in limitation, lack, discomfort, discontent, distortion and dis-ease. When we free ourselves from these unhelpful configurations, we are then able to FEEL and to more fully embody the Light, the Love, the Peace, the Joy and the Freedom which is our natural state. In consideration of the great need for folks to consciously engage in the releasement of these limiting and dissonant formations, John’s WORLD PUJAS offer a simple yet substantial Portal for major clearing work and Light Activation. The Vibrations available through this work assist in transmuting lower frequencies and in raising the Light within. This supports one to move into a loftier way of being and experiencing life; one that allows them to Live from their Eternal Self/I AM Presence rather than from their personality/ego/fear/separation consciousness which has become so prevalent upon the Earth. WORLD PUJAS are a way to engage Light and support for your Being. What is my I AM Presence? Your I Am Presence is the Presence of God that is individualized in each one of us. It is your personal Source or “I AM THAT I AM”. In the image at left, your I AM Presence is pictured as the radiant Being of Light holding space over the lower image which you could think of as your outer self, the person you may think you are, the personality, the physical body. The physical self, the personality self, the gender self, is only a very small part of who we are, for we are multidimensional beings who have Presence on many levels of awareness, and in these times of change, we are being triggered to remember that. We are beginning to look and listen and feel for the more subtle nuances behind the experiences of life in a human body. You, as a soul infused personality/body, are a stream of consciousness which has emanated from this Greater Self, sometimes called “The God-within”. 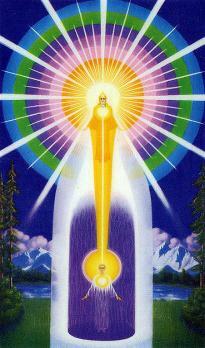 Your I AM Presence is the Consciousness, the Energy and the Light of God which is ultimately everyone’s true identity. Many have forgotten this from a long time evolutionary trend to focus more attention on the physical material world and its various unfolding illusions. But the I AM Presence, the Presence of God which is alive in all, which inspires our very breath, which IS our breath, is always there, always in Love. Yes, our God loves us without conditions and rejoices at our process of remembrance; remembering who we are as God I AM, remembering our true nature as Love, remembering our Unity with all of life, and living the process of embodying that truth consciously. It is a journey of love and remembering which all are on. Because your own I AM Presence is the sovereign Principle of God within you, John always facilitates his WORLDPUJAS and all related activations and energies to unfold in accord to the will and wisdom of your own I AM Presence. In this way, the result is always perfect for each one! Do I have to do anything to make this work? In short, NO. Your I AM Presence coalesces all that It desires through this channel and integrates it into your consciousness, your energy, your body and your life in a way which most serves your highest good. All that is required is your intention to receive, and it is done in accord to the will of your I AM Presence. John has been a natural channel since his birth and is adept at bringing through these frequencies at a Planetary Level. As well, the quality, reach and scope of the other-dimensional Beings of Light that he works with in the WORLDPUJAS Events allows for a very rich spectrum of possibility and blessing. While the actual Puja Ceremonies are held at varying locations, times, & time zones around the world, it is not required that one be able to “tune-in” at that particular time as many folks are from many other time zones and would therefore find themselves either asleep during the actual puja ceremony, or at work during the Puja ceremony. This does not in any way affect one’s reception of the Puja Energies. If you are in a time zone where you are able to sit and tune-in at the time of the ceremony, we would suggest that you might just take some time to sit or lie comfortably and just intend yourself to be open to the Energies and to simply allow whatever comes through to be experienced. However, again, this is not necessary to receive the energies as they will be integrated on your timeline by your own I AM Presence in a way which most serves you. If you have a special personal focus which you would like to invoke assistance with in association with the WORLDPUJAS Event, we would suggest that you just sit (or lie comfortably) for a time, intend connection with your I AM Presence and the WORLDPUJAS Event, and hold that prayer/request/intention/focus in your heart, offering it to your I AM Presence; then let it go. Know that you are heard, and that your I AM Presence always materializes what is in your highest good, and that what can be provided through this channel shall be given. 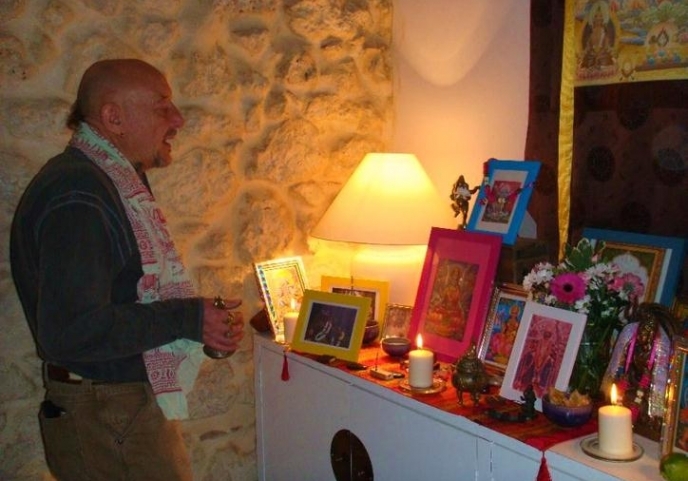 Please know that the energies begin running from the moment you sign up for a WORLDPUJAS Event and that they continue to integrate into your life & Being beyond the Ceremony. So you can just relax and know that all shall unfold in a way that is perfect for you. Many begin to notice energy shifts and various realizations and synchronicities associated with the WORLDPUJAS Events, and this is all a part of the Energy Flow which comes as a result of this work. Are there any possible “side-effects” which could be experienced related to this work? The experience of the WORLDPUJAS Energies varies from person to person and from time to time for the same person depending upon their unique needs and condition in the moment, and also on what their own I Am Presence is coordinating for clearing and activation with each event. Many become aware of transient energy flow and movement felt at varying intervals after signing up for the WORLDPUJAS Event. Many have experienced feeling very light-hearted and other lofty feelings of peace, love, and joy. Some have experienced vivid dreams or various other sensory impressions which have triggered a new awareness or a new understanding which supports their healing process. Sometimes, when there is a lot of activation, or when there are a lot of old energies being lifted from the auric fields, a person can experience a few days where they simply feel a little tired and a need for a bit more rest or sleep as the various energies are being activated, cleared, and integrated. Occasionally, if there are energies being cleared which were associated with a very emotionally traumatic event, there may be a short period where one feels a little low emotionally, as the energies are being transmuted, or perhaps they may feel a need to cry; and in this case, it is well to just let the tears come through and to know, that ultimately, this is a liberating experience to have this trauma released. So, all of these things are “normal” and it is best to just allow whatever your experience is, to be valid, and to give yourself all the love and nurturance which your being and your body are calling for. There is only a very humble donation requested for this service, 10 euro per person is all that is requested. There is also a “Family Plan” for a donation of 33 euro which allows for all household members to be included. I see you as the same Divine Light and Love as I am! As the Earth moves to support us into a loftier way of Being, all shall be drawn to remember their true self, as God, I AM, and their true nature, as Love. The journey is Love, without conditions, and freedom from fear. I am Love; and I offer what I can to assist you to remember who you are and to return to the way of Love.